Recipe number 3 from Leftover Re-Purpose Week! Can you believe it?!?! Well let me start off by saying, I love pizza, there I said it. I admit to loving a very fatty food. But honestly, who secretly doesn't love pizza?!? Now I'm not even just a plain ole pepperoni lover, I love pizza in all shapes, sizes, flavors, crusts, except Canadian bacon and pineapple.... Sorry but that's not real pizza. Now typically at least every other week we have some form of pizza in my house, be it homemade, Little Caesars, boring pepperoni, etc. Every once in awhile I will get this strong craving for Barbecue Chicken Pizza. Now mind you this is not something either The Farming Hubby or I grew up with, but when we were first married and we had been given a bread machine as a wedding gift I decided we'd eaten enough boring pizza while planning our wedding and I wanted something new. So I experimented with a BBQ Chicken Pizza. I still remember The Farming Hubby coming home from work, looking at that pizza and saying "What in the world did you do to a perfectly good pizza crust?!?!" haha! I don't really remember how that specific pizza tasted anymore, but I know I've never made that same recipe again. But I liked this concept of cooking outside the box, so I didn't give up, and decided to go in search of my perfect BBQ Chicken Pizza and for me this is it! 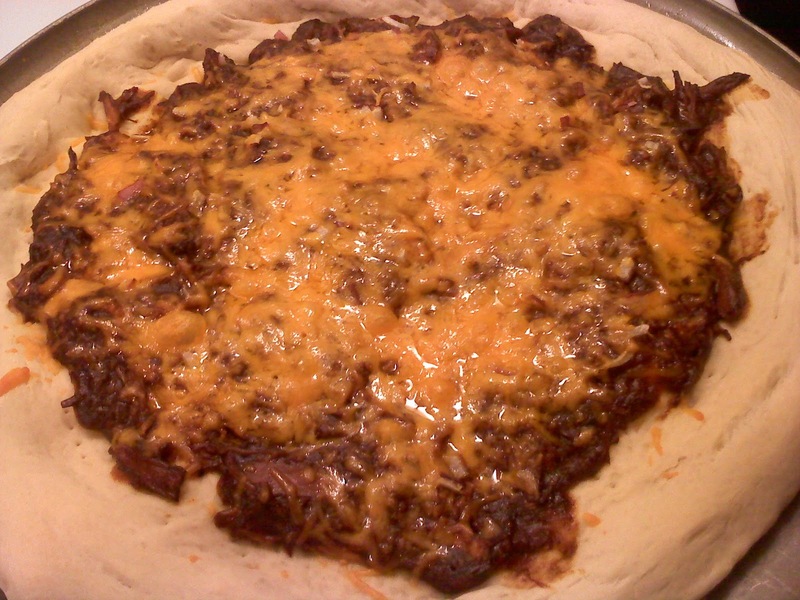 I use the same shredded BBQ Chicken that is in my BBQ Chicken Calzones. And don't get me wrong I still love those calzones, but they're a little hard for the Farming Tot to eat, and quite frankly on pizza night I just want easy peazy. I love the flavor and texture of this pizza. And it's simplicity is wonderful. It's a great way to use up the leftover BBQ Chicken from the sandwich's I originally make it for, but it is once again a TOTALLY different food experience. Place Chicken in the Crockpot, pour the bottle of sauce on top, should be enough to coat and have a little extra. Cook on Low for 5-6 hours. Once done shred the chicken with two forks and place it back in the crockpot for another hour or so to soak up more sauce. Serve on rolls, or use to make Calzones, or Pizza. This also freezes beautifully! Place dough ingredients in bread pan starting with wet ingredients. Select Dough setting, and press start. Once the dough is finished, using your hand form a round pizza crust either on your pizza pan or a pizza stone. Spread Chicken it evenly on the crust. Sprinkle Onions, and then Cheese on top of that (you can add anything else you want, but we like it simple). Bake at 350 degrees for about 16 minutes, or until crust is slightly golden and the cheese is melted. Bake longer for a harder crust, we like a softer crust. We really love this easy pizza. For us it is a treat from our normal pizza night, and for me I love it because not only does it come together pretty quickly, but it's really cheap and easy to make. And I love that I can re-use my BBQ chicken and make 2 completely different meals from it. The BBQ Chicken does freeze beautifully, so if you still have leftovers of it, freeze it and next time you want this pizza just pull it out and let it defrost! 4.5 stars.